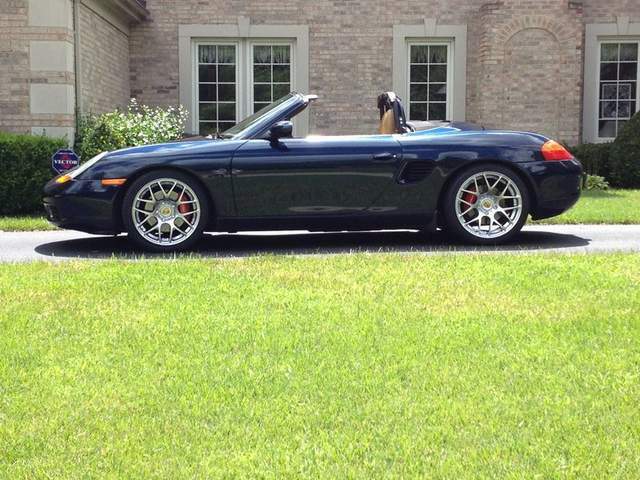 Has anyone installed this Godspeed MMX3830 MonoMAXX Coilovers Suspension Kit For Porsche Boxster 986 96-04. I'm looking to lower the car a bit to get rid of the big gap in the wheel wells. Went though this about 6 months ago, lots of reviews floating around on them. I’ve ridden in and driven an auto-x specific boxster with godspeed coils and they felt fine. I personally went with Ceika because they were easy to build with custom spring rates and valving. I used PSS9 spring rates for my build since the car is driven fairly regularly but also sees some track and auto-x time. What is your primary goal? Is your goal just to lower the car or is it to get maximum performance? Thanks for the information. I drive the car regularly during the warmer months. I also do 2-3 track/HPDE days a year. So I would like to up the performance and still keep it civilized enough for my wife to ride in. Out of curiosity, could you please share a couple of pictures of your car with the H&R springs? I would love to see how much do they drop the car. Thank you! These look CHEAP?!!? (as in- Inexpensive). I'd love to hear if anyone has used them. Thank you for the picture, you have a beautiful car! And.. it looks great without being slammed, the H&R's were a good option congratulations! Looks great.. what wheels are these? The best I'm finding is $850. I have thought the same thing. Wiser and more knowledgeable track rats than me have felt the cheaper setups are just that, cheap and don't perform well. I have no personal experience, so I can't specifically comment. I track my Boxster often and have the ROW M030 setup with camber plates in the front and that setup works well. I get 2.5 camber on the front which made a huge difference. I have had better drivers than me drive my car and they loved the setup. Yeah, this is the same conclusion I came to about the cheap coilovers.... but wouldn't it be nice if I were wrong? haha. Last edited by Gilles; 03-16-2019 at 07:51 PM.